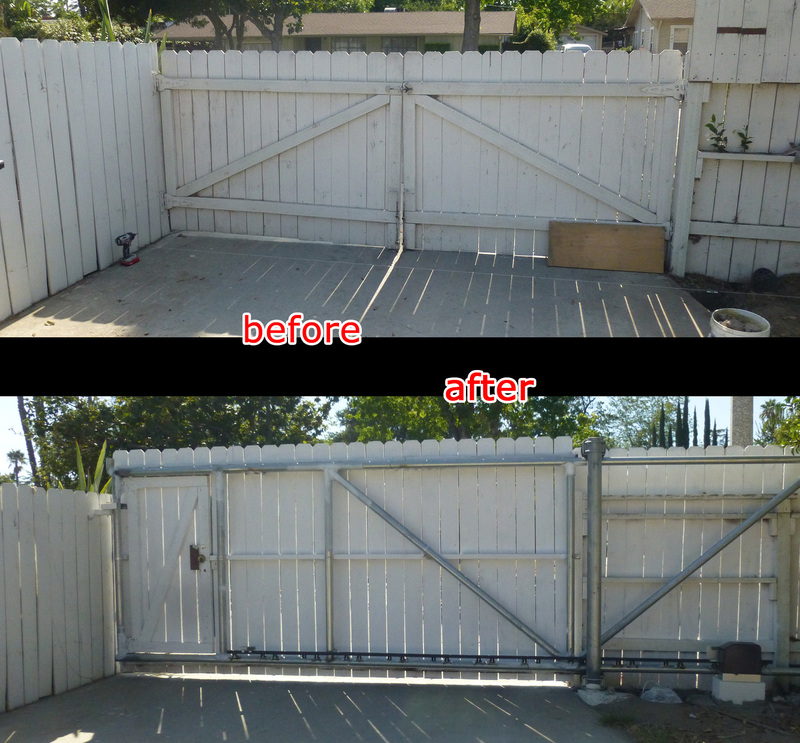 I needed to convert my old double wood swing gates to automatic sliding gate, so that I can drive my car in and out without any hassle. There were several options to do this project: 1) Hiring a contractor. It would cost me $5,000~$6,000. 2) Purchasing a kit and installing on my own, e.g. cantilever gate kits from Hoover fence Co. priced for $2636,06 plus tax and shipping, but it would still be a lot of work to assemble and install it. 3) Complete DIY. After intensive research, I decided to build it from scratches on my own. I chose to build a cantilever style sliding gate so that I wouldn’t have to deal with the pavement to put down the track. Galvanized pipes was picked for the gate framing for its low cost. According to online resource, I chose O.D. 2-3/8″ (Outside Diameter) pipe for the frame, and 4″ for the post. My existing gate opening is 12′ wide, so I needed to build a 18′ wide gate. Height would be 5′ for mounting with 6′ long wood fencing boards. In order to “clamp” the 5′ gate frame between sets of roller wheels, the post above ground is 6′ tall, that means, the post below the ground should be no less than 3′ long. This gave the total length of the post as long as 9′. Gear driven gate opener was decided against chain-driven for its low noise and smooth transition. And nylon roller wheel also won my bid for the same reason. A diagram from Hoover Fence Co. is illustrative enough to begin with. Courtesy by Hoover Fence Co.
After hard work by myself (just one person except for one moment when I asked a favor of my wife) on weekends over almost 3 months, I finally finished my cantilever sliding gate! And here are some useful information. Dia. 2-3/8″. 18 ft x 2; 6 ft x 5; 8 ft x 2. Looks amazing! I’m research I to try something similar myself. Curious how you powered this gate? Do you have to hire an electrician to properly wire it and bury the cable to the house? Great job, I really like your design. It’s been approximately 2 years since the date of this posting and your build. Have you had to make any repairs or modifications to keep the gate running smooth. I have double wood swing gates as you did and your blog will be extremely helpful. Thanks for visiting my blog. Yes, it’s been 2 years and I’m proud to report that the gate has been operating without any glitches! Thanks for the Information, Nice. Some helpful notes here. Fantastic. We’re at 75% of the legwork done. I’m a general contractor that is more familiar with the materials. a) Have a concrete company come to pour your holes $300 max. If you need to build a curb around posts go to Lowe’s and ask for Sono tube. Careful not to pour too close to gate stop location. Guys at Lowe’s will tell you what to do. Any extra concrete pour into 4″ deep pancakes straight on the ground, No need to form. make large grooves in pancakes 3″ deep at 110-20 min. Break up with sledge in 6-12 hours while still 50% soft. b) lease an ele chisel for holes with extension for hard soil/rock. Good for back/hands too. c) Have welder build on site or deliver what he builds at his shop, $80-110 per hour, most welders. He’ll need to visit to make that decision. Probably 2-4 hours work but stay with him as a helper. Only do what he says if anything. Look at some of his work around town. A lot of shops do mobile work. Taking picts with some drawings to them, a must. d) Ele can be temp until you have ele power installed at operator. Building Code is 12 to 16″ deep, sometimes less. Get 2″ pvc min and run temp (with extension cord) from house if not over 100′. Less than 2 is too hard to pull, and do in 20′ sections. You should use 14 gauge, 12 if you have to. Buy a 100′ extension cord 22-$50 new. If you don’t need ex cord later, sell on Craig’s 1/2 what you paid etc. When you do final ele, tie your wire to extension cord and pull through. ABSOLUTELY, DO NOT bury extension cord straight into ground!!! You’ll cut it later taking it out. If you don’t do ele work get electrician for final, 50-100 per hr. Most won’t risk their license doing w/o permit. Unlicensed only if you know him and still, absolutely code, no cheating. Great tips for anyone who is considering a non-DIY project! Thank you for this post, beautiful blog and quality text. A most impressive home engineering project and an enjoyable, informative read. Well done Sir.